Home/Nutrition/Should I Take Fish Oil Supplements? As a rule of thumb, whole foods are the best source of nutrition. In fact, health professionals often recommend consumers choose natural fruits and vegetables over multi-vitamin supplements. However, if you are going to take a multivitamin, please be sure that it is more of a whole food type supplement. Unfortunately, in today’s world it is difficult to get all the minerals and vitamins that we need because the earth has been so damaged by poor agricultural techniques. Higher quality vitamins will be easier to digest because they usually use better fillers unlike low cost “wholesale” vitamins where you have no idea what fillers are being used. It is usually the filler that causes the difficulty in absorption. Unlike multi-vitamins that can be hard to digest, all-natural foods provide essential vitamins, minerals, and other nutrients in a form that is easy for the body to utilize. Every rule has an exception, however. When it comes to a balanced diet, fish oil is one nutrient that consumers may have no choice but to purchase in supplement form. This is because fish oil is essential in promoting holistic health and well being, yet the body does not naturally produce it. High quality fish oil supplements can also provide the optimal balance of essential oils (omega-3s and 6s), which is something that is lacking in most American diets. “All of these diseases have a common genesis in inflammation,” explains Dr. Joseph C. Maroon, vice chairman of the Department of Neurological Surgery at the University of Pittsburgh School of Medicine (ii). According to Dr. Maroon, the omega-3 fatty acids in fish oil supplements have the ability to prevent or treat a vast number of serious health conditions simply by preventing inflammation, or swelling. A Note to Our Readers: Always consult a licensed health professional prior to making any changes in diet or exercise. Then, review the information below to better understand how to choose a fish oil product that will effectively supplement your diet with a good balance of essential fatty acids (EFAs) like omega-3s, omega-6s, and DHA. According to Dr. Julie McLaughlin, there are 3 main criteria that must be evaluated when shopping for a fish oil supplement: Form, ratio, and dosage. The fish oil manufacturing process begins with pressing the fish and other ingredients into oil, called a triglyceride. Manufacturers then use an alcohol solution to remove heavy metals and other toxins from the oil. However, few manufacturers remove the alcohol solution prior to selling the supplement. To get the most natural form of fish oil available, Dr. McLaughlin recommends finding a re-esterfied triglyceride (rTG) supplement in which the alcohol component has been removed prior to packaging and sale (iii). Other high fat snack items like chips, doughnuts, and foods fried in vegetable oil. Dosage: What’s the Most Effective Daily Dose? Lupus: Recommended 2 grams, 3 times each day. Psoriasis: Recommended 2 grams, 3 times each day. Raynaud’s phenomenon: Recommended 1 gram, 4 times each day. Rheumatoid arthritis: No more than 2.6 grams, twice each day. (i) “What to Know About Omega-3s and Fish.” Web MD. Accessed 8 March 2013. (iii) “Don’t Skip a Beat with Fish Oil.” City Holistic Online. Accessed 8 March 2013. 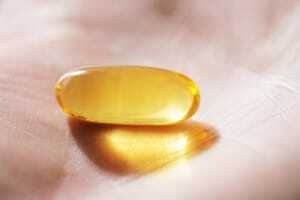 (iv) “What to Know About Omega-3s and Fish.” Web MD. Accessed 8 March 2013. (vi) “Fish Oil Recommended Daily Intake.” Livestrong.com. Accessed 9 March 2013. (vii) “Supplement Guide: Fish Oil.” Arthritis Today. Accessed 12 March 2013.